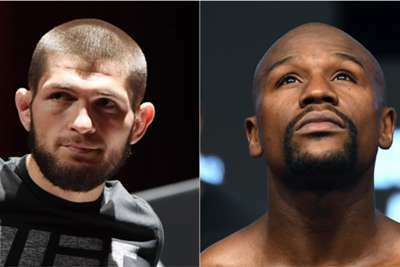 Floyd Mayweather Jr. says he is ready to take on UFC lightweight champion Khabib Nurmagomedov. Nurmagomedov challenged Mayweather after successfully defending his title earlier this month at UFC 229 with a fourth-round submission win over Conor McGregor, who stepped out of the octagon and into the ring last August to take on Mayweather. McGregor lasted 10 rounds, but Mayweather ultimately maintained his perfect record and the retired boxing star has now turned his attention to Nurmagomedov. "We're fighting," Mayweather told TMZ Sports. "I'm my own boss. I can't say what's going on on Khabib's end, but on my end we can make it happen." When asked if the potential bout with the also undefeated Nurmagomedov would be a boxing or mixed martial arts contest, Mayweather was candid with his response. "Who's the A-side? He called me out, so you have to come to my world," Mayweather said, adding that he expects a nine-figure deal should an agreement be reached. "I seen in an interview, he said when he hit Conor McGregor, he knocked Conor McGregor down. He said I didn't knock him down. OK, Khabib. You got my leftovers. Whoop-dee-do." It has long been rumoured that Mayweather would fight Manny Pacquiao in a rematch. It has also been reported that Mayweather would come out of retirement and fight in the UFC in a rematch with McGregor. Nurmagomedov and McGregor have temporarily been suspended by the Nevada State Athletic Commission for their roles in the brawl that followed their UFC 229 bout, with a meeting set for October 24 to discuss further penalties.